Bruce Schneider, who owns Schneider Vineyards with his wife Christiane, is a man after my own cabernet franc-loving heart. Instead of being like most every other North Fork producer, his red wine programs isn't dominated by merlot and merlot-based blends. He does what he thinks works here. He focuses on cab franc. And he will continue to do so, even after selling his 14.5-acre Roanoke Point Vineyard in Riverhead last year (which sadly is no longer a vineyard). 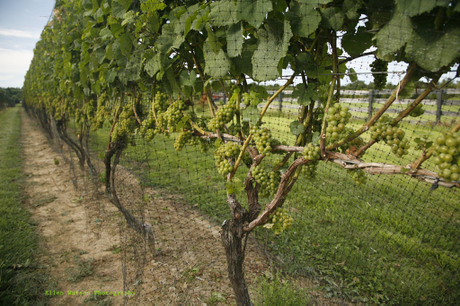 Starting with the 2007 vintage, Bruce will make his wines from fruit grown at the leased Jackson Hill Vineyard, a small vineyard in Mattituck, managed by Ron Goerler of Jamesport Vineyards. 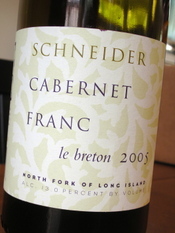 Schneider Vineyards made four different cabernet franc-focused wines in 2005, this being the one made with 100% cabernet franc grapes. On the nose, it's obvious that Schneider was shooting for a Loire Valley style, with cherry and blackberry notes accented by flower petals, herbs and spice. The medium-bodied palate is ripe, but not overly so, with juicy red fruit, spring herb and earthy spice flavors that dance within a wine with food-friendly acidity and soft, integrated tannins. The finish lingers nicely and most definitely makes you want to take another sip. Schneider doesn't have a tasting room, but his wines are poured at the co-op The Tasting Room in Peconic. I drink a fair amount of wine, which will come as no surprise to any of you. If I didn't drink wine, I guess I wouldn't have a wine blog now would I? But what might surprise you is that I probably drink just as much beer. Yes, really. There may have been a time in America when beer and wine drinking was an either-or situation. You drank wine OR you drank beer, not both. But I don't think that's the case anymore. Beer is slowly, and thankfully, starting to get its due among those who care about what they are putting in their mouths. Of course I'm not talking about American mega-brews. Those light-yellow, high-carbonation, near-flavorless beers might be acceptable at a football game on a frigid when one is merely looking to warm him or herself any way possible, but not with dinner or on a hot summer day. Why am I bringing this up? Who cares? A couple reasons actually. First, you're going to start seeing a lot more local beer coverage here on LENNDEVOURS. Consider yourself warned. 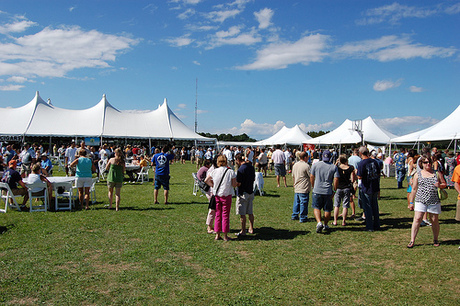 Secondly, if your experience with beer has been limited to those mass-produced, character-less beers we all see on television commercials, you need to make sure that you attend next year's North Fork Craft Beer Festival. I went to the latest one a couple weeks ago at Martha Clara Vineyards and was able to taste a great many honest-to-goodness, how-its-supposed-to-be beers in one place. I'll make sure that I give you plenty of notice on next year's. I'm planning to go again for sure. Last Thursday night I was fortunate enough, to attend a dinner hosted by George Riedel at Suzanne's Fine Regional Cuisine on the eastern side of Seneca Lake. The weather was fantastic, and the view of the lake was both breathtaking and (because it was looking due west) allowing for the sunset to complement the scenery and create a Finger Lakes panoramic that was truly beautiful. George Riedel used only one of his famous decanters during the evening, but through this vessel flowed a great deal of wine from the Finger Lakes and all over the world. Representatives from Fox Run, Sheldrake Point, Lucas, Glenora, and Hunt Country were all in attendance, and these winemakers and owners brought samples of their wines to share. 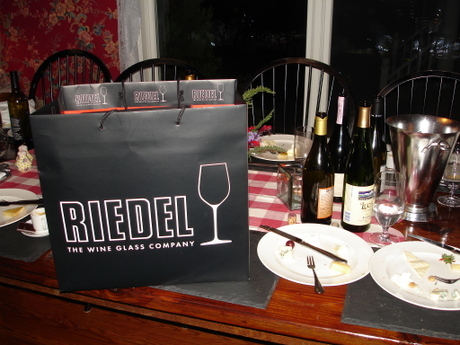 Riedel was kind enough to order from Suzanne's list many exemplary wines from the Finger Lakes and Europe. There were far too many to keep track of. The dinner consisted of three main courses of Maine scallop, free-range duck, and lamb, with a cheese dish for dessert. The food was excellent. Mr. Riedel turned to me at one point and exclaimed that the food was "fantastic." For an individual who must dine frequently at world-class restaurants, it certainly was a ringing endorsement. The Finger Lakes wines that were offered by the owners in attendance included Glenora's 2007 Pinot Blanc, Fox Run's 2005 Cabernet Franc reserve, Lucas' 2007 Riesling, Hunt Country's 2007 Valvin Muscat, and Sheldrake Point's 2007 Gewürtztraminer. All of these wines showed very well, but the Fox Run Cabernet Franc and Sheldrake Point's Gewürtztraminer were real stand-outs, the latter being one of most interesting Finger Lakes Gewürtztraminers I have had the pleasure to taste. While George Riedel hosted this dinner as a prelude to the tasting exercise the next day, the result of which would highlight one of his glasses as the ideal Finger Lakes riesling glass, it became clear over the course of the evening that he sees the Finger Lakes as more than just another business opportunity. I found his conversation engaging and I believe he sees a great deal of potential in the Finger Lakes wine industry. Riedel first visited the Finger Lakes earlier this year. It's obvious that he wanted another look. At the end of the day it's all about selling more glassware, yet there's something to be said about Riedel's confidence in the Finger Lakes as a good investment of his time and attention. For Part II of the Riedel report, I will tell you about the tasting and selection of the Finger Lakes Riesling glass and offer my thoughts on the authenticity of such an experiment. It takes a little digging on their less-than-stellar website to find them, but the New York Wine and Grape Foundation has finally posted the full medal results from the 2008 New York Wine & Food Classic. Thanks to our trip to the Finger Lakes this spring, I've actually tasted many more of these wines than in previous years. But, it doesn't make a whole lot of sense for me anyone to argue with the results. They used professional tasters and we can only assume that they adhered to typical competition procedures. The results are what they are. Are there wines that I think deserve far better than what they got at the Classic? Are their bronze medal wines that I think far outshine some that got gold? Absolutely. The opposite is true as well. There are wines that won gold that I don't like at all. That's how these competitions go. Remember, we all have different palates people. And even "expert" judges aren't right 100% of the time. Especially not when you're tasting as many wines as they did. There are sure to be complaints from winemakers and winery owners from all over the state. Check out the full results and if anything strikes you, leave a comment. Riedel crystal is one of the more interesting facets of the greater world of wine business. Proponents laud the design of these stemware pieces and their supposed effect on the enjoyment of many different types of wine. Others think it's a bunch of hooey. While most wine enthusiasts concede that the shape and design of glassware can affect the presentation of wine, many observers have balked at the sheer number of Riedel pieces and have wondered aloud whether a dozen of, say, different chardonnay glasses really speak to the nuances of regional influence on one variety. Whatever the case may be, Riedel is here to stay and their presence in the wine universe is becoming slightly larger. Through the efforts of Finger Lakes Wine Country and its partners, Riedel's namesake, Georg Riedel, is coming to the Finger Lakes this week to preside over a tasting of Finger Lakes riesling. The series of tastings will help choose which of the existing Riedel riesling glasses best aids the natural aromas and flavors of the region's standout variety. I'm lucky enough to be attending dinner at Suzanne's on the eastern shore of Seneca Lake this evening in honor of Mr. Riedel. On Friday morning there will be a closed tasting using Riedel stemware consisting of a panel of professional journalists, critics, and winemakers at Sheldrake Point. And then that evening, I will be attending a more public tasting at Glenora and will be a tasting participant. The overall goal of these tastings is, I'm told, to select a specific Finger Lakes riesling stemware piece. How this selection will manifest itself in terms of marketing outreach by Riedel or the Finger Lakes itself remains to be seen. I'm sure this will be an exciting series of events and I will soon report on one of the more interesting developments to come to the Finger Lakes in some time. Okay, so I'm a little late pulling this together. As anyone who has hosted WBW knows, the least-fun part about doing so is compiling the roundup post. Sure, it's fun to read everyone's submission, but typing them up in one place just isn't very fun. I wish LENNDEVOURS could afford a free intern. Yes, I know a free intern is free. Anyway, we had 34 participants this time around (including yours truly). Some of these blogs were, I'm embarassed to say, new to me. I don't read as many blogs as I used to. But, I'll be adding several new ones to my Google Reader later today. Thanks to all who participated for making WBW's 4th birthday a fun, interesting one. In no particular order (just the order I jotted them down in, really), I give you the 34 40 brave souls who sipped into their wine pasts. Wine Biz Radio: Clos Du Val 2005 Napa Valley Cabernet Sauvignon. Vinomadic: Joins the fray with his WBW 48 post. Domaine547: Jill actually did two WBW posts this time around: here and here. BroolynGuy: My Loire-loving buddy Neil looks back at Bordeaux. Catavino: Can't believe that I missed Ryan and Gab's post the first time through. Luscious Lushes: Missed this one too. Sorry! Sorry that I just don't have the time for witty commentary on each post. Perhaps I'll revisit some of the highlights (and lowlights) of this list in a future post. If I missed anyone, just shoot me an email and I'll add you. Boy, Bedell Cellars is having a good week. 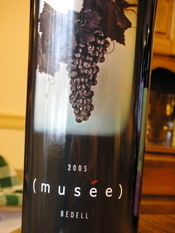 Their unreleased 2006 Musee won "Best Red Wine" at the 2008 New York Wine & Food Classic this week. Swedish Hill Winery was also named "Winery of the Year" for 2008, partly the result of their 2007 Vidal Blanc winning the Governor's Cup as the best wine overall, beating out 774 other wines. The full list of class and category winners is below. Each class winner was eligible to win the Best of Category when the wines were re-tasted. Full medal results will be posted on newyorkwines.org soon apparently, but they aren't up yet. As always, some interesting results, but without knowing what wines were submitted (many of the state's top wineries don't submit wines to the competition), it's hard to offer much commentary. Congratulations to all of the winners. Does it strike me as a little odd that a non-vinifera wine was named the best wine in the state? Sure. But, that's what the judges found with their own noses and tongues. Try it for yourself if you can get your hands on a bottle. I've had several delicious vidals in recent years. Rather than repeat what you can already see over at Vinography, I'll just point you to Alder's post, which points to the article itself and further details on the author's blog. Can just about any restaurant (real or fake apparently) win a Wine Spectator Restaurant Award, regardless of the wines on its list? It would appear so. 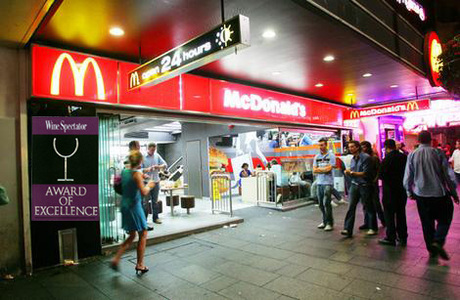 If it's all true, look for Wine Spectator Restaurant Awards in your local TGI Friday's and McDonald's soon. As the founder of Wine Blogging Wednesday, I'm familiar with how much fun virtual wine tastings can be. But what Bin Ends is doing with its Twitter Tastings takes it all one step further... and I'm happy to be participating in tomorrow's event. Tomorrow, August 19 at 7 p.m. Bin Ends is hosting the second Twitter Taste Live event. The special guest will be Etienne Hugel of Hugel et Fils, who be joining us live on Twitter from Alsace. My friend Tim Elliot of Winecast will be co-hosting. 2004 Riesling Jubilee "Grand Cru"
It should be a lot of fun. I missed out on the first tasting, so I'm really looking forward to this one. I've been tough on the Wine Specator in the past (and I'll likely continue to do so) but maybe they are coming around to Long Island wines. One can certainly hope, can't he? Obviously a 90-point score is quite a win for Bedell Cellars and those trying to sell this wine. Congratulations to the folks at Bedell. It's also a big deal for a region that hasn't seen many WS 90s over the years (though I think as more 2005s come to market we'll see scores that equal and better this one). I noticed a week or two ago that Bedell has increased the published price on this wine from $65 to $75, which says to me that they knew this score was coming and hope to reap the benefits, which is absolutely what they should do. With only 400 cases, and much of that probably already sold, this wine might be difficult to find very soon. I reviewed this wine back in early April, and I gave it a 3.5 (which works out to an 88-89 if you want to convert to the 100-point scale.) It's still such a young wine. I think it's best days are ahead. I think it will last beyond 2010. At least I hope so. Do people buy a lot of $75 wine that they have do drink within a year or two? I know that many of my readers have tasted this wine. Share your thoughts in the comments. And, what other Long Island reds do you think warrant a 90+ point breakthrough? 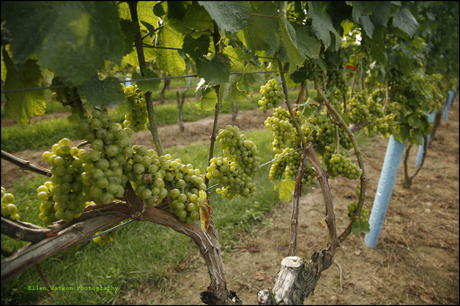 How the HAIL are Long Island vineyards dealing with this crazy weather? If wine is truly made in the vineyard — and any quality-focused winemaker will tell you that it is — Long Island wine is being made in one messy kitchen by one crazy chef this year. That chef being mother nature of course. In many ways, Long Island is the perfect place to grow classy, world-class wines… but there are challenges too. Hungry migratory birds and resident deer can decimate crops in short order. The same bodies of water that delay the first winter frosts also mean high humidity levels that can bring disease and rot. The threat of a hurricane that roams further north than usual is a nightmare scenario for any East End vineyard manager. Rich Pisacano, co-owner of Roanoke Vineyards and another industry veteran agrees, telling me that the hail was a “first experience for us.” Luckily, the damage to his Riverhead vineyard wasn’t wide spread. “There was very little foliar damage, but strangely (we have) some damaged berries that are already drying on the vine and are falling off,” he said. That means a smaller crop, but it shouldn’t affect quality. Hopefully Long Island’s viticultural bullpen is better than that of his beloved Mets. This is one of the first wines I got as part of my partnership with the California Wine Club, and I have to admit that I really enjoyed it. I've long been a fan of Zinfandel, and I particularly liked the QPR of this one at $15. A medium-dark cherry red in the glass, the nose is everything you'd expect -- cherries, raspberries, red licorice and black pepper. On the palate fresh, almost lively, cherry and cherry confection flavors are accented by spicy black pepper and dusty cocoa notes. The most impressive thing, especially at this price point, is the wine's balance. At 14.9% ABV, it's not hot or boozy like some zins can be. Here, the medium body, fruit, acidity and subtle spice come together in a nice, affordable zinfandel that I'd absolutely drink again. I wish I could say the same about the Pedroncelli petite sirah that was shipped with it, but that's a story for another day. In recent weeks I've had several readers tell me that they'd like more "newsy" information here on LENNDEVOURS. With that in mind, I'm going to bring back the Sips and Slurps posts every Monday (or close to it) with little news tidbits that crossed my desk during the previous week. To any members of the New York wine industry who would like their news to be included, just send me an email. Paumanok Vineyards' 2007 Chenin Blanc was featured in Lettie Teague's most recent Food and Wine Magazine piece about buying wines from great vintages. I've enjoyed several bottles of this over the past month or so. You can read my review here. 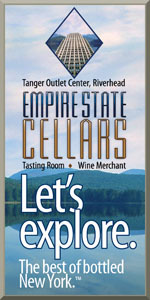 Several Finger Lakes wines were scored the latest issue of the Wine Specator. As I've come to expect because of WS's poorly conceived 'blind' tasting process, none of them broke the 90-point barrier. The top scores were awarded to Wagner Vineyards' 2006 Vidal Ice Wine (89), Anthony Road Wine's 2007 Semi-Dry Riesling (88), Lamoreaux Landing's 2006 Semi-Dry Riesling (87), Red Newt Winery's 2005 Cabernet Franc (87) and Rooster Hill's 2007 Dry Riesling (87). On a much brighter Finger Lakes note, Fox Run Vineyards has been chosen as one of the world's top 100 wineries by Wine and Spirits Magazine. Owner Scott Osborne and winemaker Peter Bell are doing some great things up on Seneca Lake and it's great to see a New York winery included on this list. The issue comes out on October 5. 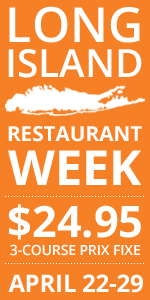 Here on Long Island, Roanoke Vineyards' 2004 Blend One was chosen as the wine of the week by Newsday. Get some while you can though... it goes into the library on August 24 and the 2005 bottling will be released the next day. The new vintage takes the Blend One in a new direction with the inclusion of a significant amount of malbec. This week, 25 judges will taste and nearly 800 New York-made wines at the Mohonk Mountain House in New Paltz as part of the New York Wine & Food Classic. The Classic is New York's largest wine competition, and even if I've been a bit critical of it in the past, it is an important competition that focuses solely on New York wines. This year's judging panel consists of 7 tasters from California, 11 from New York and 7 from the rest of the U.S. The California contingent includes Dan Berger, wine journalist; Rene Chazottes, wine director of the Pacific Club; Mike Dunne, food and wine writer for the Sacramento Bee; Traci Dutton, Director of Education at the Culinary Institute of America-Greystone in the NapaValley; Ziggy Eschliman of Wine Country Radio; Ann Littlefield, Direct Wine Marketing Brand Champion in Napa; and Dr. Bob Small, Director of the Los Angeles International Wine & Spirits Competition. The New York tasters are Molly Battenhouse, DWS, Wine Director & Educator at the International Wine Center; Shannon Brock, Wine Coordinator at the New York Wine & Culinary Center (and friend of LENNDEOVURS); Rory Callahan, President of Wine & Food Associates; Jim Clarke, Wine Writer and Director of Wine at MEGU restaurant; Lorraine Hems, CS, CWE, Lecturer of Wine Studies, Rochester Institute of Technology; Fred LeBrun, Columnist at the Albany Times-Union; Bill Mahoney, Wine Manager, Premium Wine & Spirits in Buffalo; Bert Miller, Food & Beverage Director of the Long Island Marriott; Jerry Shriver, Writer, USA Today; Eric White, Wine Consultant & Store Manager at The Winery in New York City; and Kevin Zraly, Wine Educator & Author. Those from other states include Hudson Cattell, co-publisher of Wine East (PA); Doug Frost, MW and MS, Wine Writer and Educator (KS); Ann Miller, Marketing Consultant for the Missouri Wine & Grape Board (MO); Jerry Pellegrino, Chef/Owner of Corks Restaurant (MD), Mike Riley, Wine Buyer for Wegmans (NJ); Coke Roth, Wine Consultant (WA); and Sandra Silfven, Wine Writer, Detroit News (one of my favorites). The winners in every category will be announced on Wednesday... as will the Governor's Cup (best overall wine) and Winery of the Year (which unfortunately is based on number of total medals instead of most golds or double golds). Look for the results here later this week. You know I'll have something to say about them. I won't call it a vacation, since I'm only sleeping in a bed other than my own for a single night. 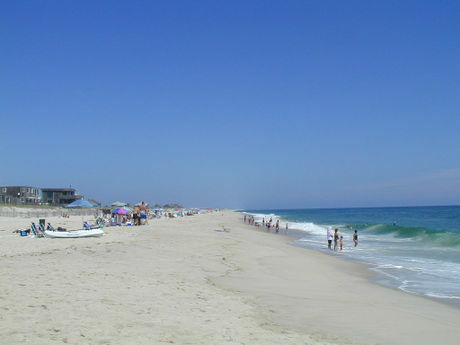 But, tomorrow morning, I'll be heading out to Ocean Bay Park on Fire Island for a little R&R. Nena is already there and so are many of our friends. I think there is WiFi at the house, but I'm leaving the laptop here. 36 or so hours without the Internet won't kill me. Blogging will resume Friday night or Saturday morning. Welcome to Wine Blogging Wednesday's 4th birthday celebration. That's right, it's the 48th edition of the wine blogosphere's favorite monthly online tasting event. As the humble founder of the event, I decided to host the event and ask participants to take a look back... back into their wine-drinking history. As I said in the original post, we're all wine lovers, but we have gotten where we are today in a variety of ways on a variety of paths. These long, windy paths are littered with wines the world over. I just want you to pick one of the wines from the beginning of your journey, taste it again for the first time in a while, and tell us about it. When I started to look back into my own wine history, many wines fit the bill for WBW 48. Of course, I didn't want to drink Mad Dog 20/20 or Thunderbird (the only 'wine' I drank in college). The first wine that made me stop and say "aha" was actually Caymus Conundrum. It was the first wine that tasted like something other than "just wine." I didn't want to taste that one again though, because I've had it fairly recently. 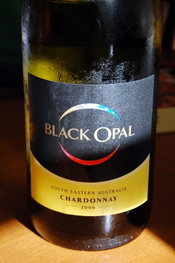 Of course, after tasting this Black Opal 2006 Chardonnay, maybe I should have had the Conundrum. When I was in graduate school, I drank a bottle of this almost every weekend. Why? It was cheap and I thought it tasted good at the time. And, I could get it at the wine shop right around the corner from my tiny little apartment just off of Carnegie Mellon's campus. Plus, my cooking skills were beyond rudimentary, so it didn't really matter what I was drinking with what I was eating. Or at least I didn't think it did. Wine was more sophisticated than beer, and because I was in grad school I wanted to leave the frat boy behind and "grow up." Funny, no? I actually had a bit of trouble tracking this wine down. In fact, the only place I could find it only had it in 1.5L bottles, so that's what I bought... for $10. I guess when a wine seems to only be available in a 10-dollar magnum, you know what you're getting... awful wine. And that's exactly what Nena and I were forced to taste in the interested of WBW glory. This wine is actually exactly what I expected... slightly sweet peach and tropical-pinappely fruit that has been bludgeoned by new oak. This isn't a wine that I'd pair with food. It isn't a wine that I'd drink on it's own. I wouldn't even use it to make white wine vinegar. It's not flabby per se. There is some acidity here. It's even almost balanced in that sense, but the raw, toasty, vanilla oak here is amazingly bad. I didn't dump it yet, though. I may taste it again tonight. Apparently I'm a glutton for palate punishment. Come back over the weekend to see a round up of other WBW participants. I think we'll see some interesting entries. Last week, members of the world’s wine industry descended upon Stony Brook Southampton for “The Art of Balance, Cool Climate/Maritime Wines in a Global Context,” a symposium organized by the Stony Brook Center for Food, Wine and Culture, and the Long Island Wine Council. Over two days of presentations and panel discussions, many topics were covered, including the various winemaking techniques employed by the winemakers, global climate change and its impact on those winemaking decisions, “natural” winemaking and the elusive concept of terroir—a French term loosely defined as a wine’s sense of place. Far too much ground was covered to fit it into a single blog post, so today we'll cover some generalities and some overall impressions. Then, we'll target some of the most interesting statements and topics in future posts. I think what made the biggest impression on me was that there are a lot of cool-climate winemakers doing a lot of different things in the pursuit of a common goal — perfection. The passion oozed from these men and woman. It was inspiring. It really was. There were, of course, a couple uncomfortable moments, even controversial ones. When asked what they thought of Long Island’s wines, the first day’s panel offered mixed reviews. Thomas Laszlo, VP of winemaking operations at Heron Hill Winery in the Finger Lakes, wasn’t impressed by Long Island chardonnays, calling them “thick” and saying that they show a “similarity across the board." I have no idea how many different chardonnays he actually got to taste in his short time visiting the area, but I have mixed feelings on the matter. On one hand, I think that there are many different styles of chardonnay being made here with various amounts of oak and malolactic fermentation. I don't think, however, that these are the white wines that Long Island does best. They aren't the wines that will put or keep the region on the map either. Laszlo found blends from Bedell Cellars and Channing Daughters Winery much more to his liking. Oddly, he didn’t mention sauvignon Blanc, the grape where many others think Long Island’s white wine future resides. I'm one of those 'others' by the way. On day two, Clifton was much more complimentary, telling those assembled that he thinks that “the wines are as world class as from any region I’ve been in” adding that "New York should be getting 90s" referring to elusive and undeniably important wine ratings. Clifton finished by saying "I feel like I'm in Santa Barbara 10 years ago." Of course North Fork winemakers don’t have the advantage of a blockbuster wine movie to help justify and substantiate the work they are doing. Now this is something a little different and definitely delicious. 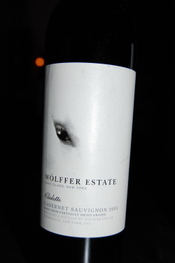 Winemaker Roman Roth has outdone himself with his Wolffer Estate 2005 Claletto Cabernet Sauvignon ($85), a wine that makes his 2005 Barbera (Long Island's first) seem absolutely pedestrian. Made with 100% cabernet sauvignon (from Roanoke Vineyards on the North Fork) a portion of the grapes were allowed to dry on the vine, resulting in an Amarone-style wine that brings a lot of flavor and alcohol (15.9% ABV) to the glass. Extremely dark, and inky in the glas, this wine has dense, warming aromas of speck-wrapped roasted figs, anise, blackberries and vanilla. Big and even meaty, it shows layers of black licorice, fig and blackberry flavors with sweet, plush super-ripe tannins. There's a hint of alcohol heat on the finish, but it's not overwhelming. The finish lingers for minutes. Only 118 cases were made and it will be fascinating to see how this wine develops in the cellar. At $85, it's clearly not an everyday wine, but taste it in their tasting room if you can. Every Long Island wine lover has to taste it at least once. 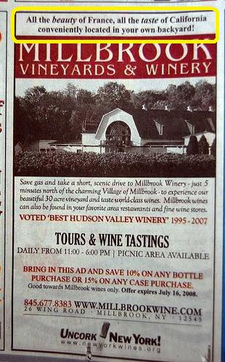 Millbrook Vineyards & Winery's recent ad campaign is both disappointing and annoying. I think it sets the "drink local" movement back at least ten years. As you can see to the right, they are lauding themselves as having "All the beauty of France, all the taste of California." Not wanting to take anything out of context, it's important to note that I understand what they are trying to do here. With gas prices and the economy the way that they are, the "staycation" (a vacation where you stay close to home) is a hot trend. They want people to know that they can have a great wine experience in their "own backyard." I get that. Everyone should know about their local wine country. But for what is widely considered the Hudson Valley region's top winery (even if a bunch of their wines are made with California fruit) to not focus on the unique qualities of the Hudson Valley (and its wines) and instead turn to the 1990s style of "we're like France" and "we're like California" marketing just seems lazy. Anyone who has visited the Hudson Valley knows how beautiful it is... in its own right. It doesn't need to be compared to an entire country (which is silly anyway, right?) I mean, what part of France are they talking about? I'm sure there are parts that are uglier than others, right? New York wineries need to grow and evolve to the point where they stop comparing themselves to everyone else. Do what you can do best and promote your unique quality. Please. You've probably noticed that LENNDEVOURS has a new sponsor, the California Wine Club. When the first contacted me, I wasn't interested... and with good reason. This is a New York wine blog and I don't sell advertorial. But, when they offered to send me the monthly club shipments and let me write open, honest reviews of the wines if I want to, I became a bit more interested. When they told me that they'd be up for me doing blind tastings against New York wines, I decided they were a company worth partnering with. So, please welcome the California Wine Club to the LENNDEVOURS family and keep an eye out for the first reviews, which should be published this week. Of course, the first shipment didn't allow for blind tasting (it was a zin and a petite sirah and those aren't grown here) but future shipments likely will. Barbera from Long Island? It would appear so. I didn't even know that it was being grown anywhere locally (outside of Alice Wise's research vineyard at the Cornell extension), but there is 1/3 of an acre grown at the North Fork's Indian Neck Farm. 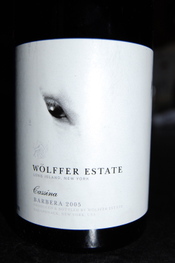 And, every last grape from that block went into the mere 71 cases of Wolffer Estate Vineyards 2005 Cassina Barbera ($40), which was named for a 14-year old Hanoverian Warmblood, and is 78% Barbera, 12% merlot and 10% cabernet franc. Medium-dark crimson red with a lighter, brick rim, the nose is inviting with red cherry, rose petals, clove, black pepper and hints of brown sugar. Medium-bodied with medium, slightly-astringent tannins, it's a bit more straightforward on the palate with cherry-vanilla and just a little brown spice. Alone, this wine is very good, but with a meal of my mother in-law's eggplant parmesan, the berry flavors and table-friendly acidity stood out. is celebrating its 20th anniversary with six limited-release wines that "push the boundaries of Long Island winemaking." Roman Roth, hired by Christian Wolffer in 1992, is known as one of the region's premier winemakers and these new wines both exemplify and no doubt challenged his winemaking acumen. Each is named for a horse from the Wolffer Stables, a 100-acre, 80-stall facility that apparently has the largest indoor riding field on the East Coast. 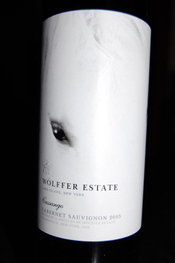 I got to taste four of the six wines last weekend, and today we'll start with the Wolffer Estate Vineyards' 2005 Cassango Cabernet Sauvignon ($40). Cabernet sauvignon can be a risky proposition on the East End. 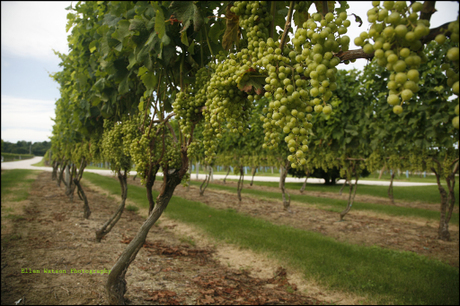 In anything but the best vineyard sites, it can be difficult to ripen and often results in thin, green-tasting wines. But this wine, a blend of 86% Cabernet Sauvignon, 9% Merlot, 5% Cabernet Franc, is proof that in hot years like 2005, Long Island cabernet sauvignons can be both intensely flavorful and elegantly age-worthy. A rich, deep purple in the glass, the nose is just as dark and intense, with aromas of crushed blackberries, black cherries and figs backed by toasty vanilla, minty-basil and faint smoke notes. Medium bodied and ripe across the board--fruit and tannins--the flavors closely match the aromas with a long, earthy finish that hints at gravelly, mineral character. Drinking well now after decanting, this one will improve for years--even a decade or more. Only 157 cases were made. By the way, Cassango is a 17-year old Hanoverian Warmblood that lives at the stables.